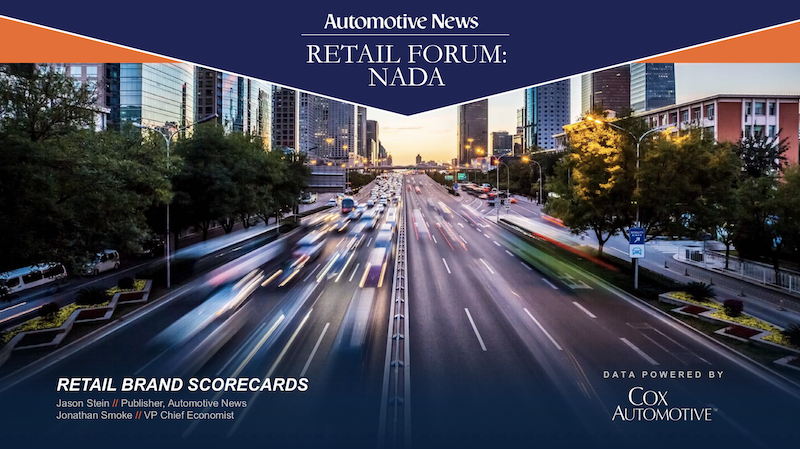 New Brand Scorecards Study Debuts at NADA 2019 - Cox Automotive Inc.
Jonathan Smoke, chief economist for Cox Automotive, and Jason Stein, publisher of Automotive News, debuted the new Retail Brand Scorecards Study at the Automotive News Retail Forum at NADA today. This annual study measures and compares six areas of performance relevant to a franchise dealer’s ability to succeed. Retail Brand Scorecards are created with data powered by Cox  Automotive in association with Automotive News. In the study, 20 non-luxury and 14 luxury brands are considered. To select an overall best-in-class non-luxury and luxury brand, all brands are also assessed in two additional attributes – Geographic Consistency and OEM Mandates and Restrictions. To see which automakers made the grade and are recognized as non-luxury and luxury valedictorians this year, read the press release here. Full detail of the Retail Brand Scorecards, with the top and bottom finishers in each category, can be downloaded below. This annual study measures and compares six areas of performance relevant to a franchise dealer’s ability to succeed.